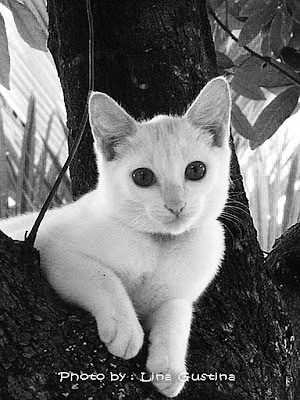 This female white cat, Cimu, belongs to my neighbor. It was captured a few months ago. At that time, she often played on the tree across our home. I haven't seen her around lately, perhaps the owner doesn't allow her to wander anymore. He/she/it looks lovely. What breed is this cat? Sweet... don't often see a pure white cat. She seems to be posing for the photographer. Great shot of the cat. That's a great portrait, I like the reflection in the eyes, too. That is one beautiful portrait of a cute little cat. Excellent. she is very VERY PRETTY! thanks for sharing her picture..
What a little beauty! An excellent photo too.